The Timex Ironman Race Trainer is an exercise heart rate monitor and full featured Ironman sports watch. Coupled with the TrainingPeaks web site to download and view your data and get training programs, this is a system that anyone can use for race training, or simply tracking diet and exerecise. You can view your heart rate with the time of day and while using the chronograph and timer. I found it easy to move between functions with the Race Trainer. It has a large number display and a night light. While I found the lower model, Road Trainer, to be good, I loved the online functionality of the Race Trainer. Computer connection set-up not spelled out in instruction manual. Has a minimum and maximum heart rate alert, five pre-set heart rate zones and a customizable zone. Monitoring your heart rate is a great way to tell whether you are working out at the correct level. I found the chest strap used by the Race Trainer to be fairly comfortable and I didn't have any difficulty with it losing contact and transmitting erratic data. You view your heart rate on a Timex Ironman watch. You can choose a pre-set heart rate target zone or enter your own zone. After your workout, you can see how much time you were in your chosen zone. During your workout, you can see your heart rate displayed above the time of day, or switch modes to see it in big numbers, with the time of day above it in smaller numbers. You can choose to see your heart rate in either beats per minute or in percentage of maximum heart rate. You can choose to have the watch beep when you are above or below your chosen heart rate zone. The watch also has a chronograph, so you can time activities and record splits or laps. It has a countdown timer. It has three alarm settings as well. The interval timing feature and 10-workout memory make this a trainer to be reckoned with. The intervals are customizable and I found them very easy to operate. With a 10-workout memory, if you get confused and end a workout, you usually have a few spare ones to keep recording. 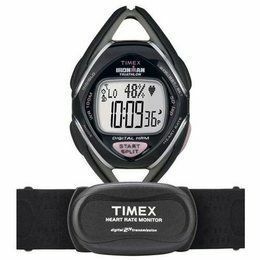 To get the most out of the Timex Race Trainer, buy the Kit version that includes a USB Data Xchanger to download your workout data to the TrainingPeaks web site. The online training tool allows you to view your heart rate and workout data, record your food intake, and download workouts. The batteries in the chest sensor can be easily replaced without any tools. But you need to take the watch to a jeweler to replace the battery in the watch. Because I am used to the operation of Timex sports watches, I found the Timex Race Trainer to be easier to use than other brands. Do You Need a Heart Rate Monitor to Get a Better Workout?